The Detroit Zoo is one of only five U.S. zoos that provides a home to the mountain chicken frog. It can be seen at the award-winning National Amphibian Conservation Center – a leader in amphibian conservation and research – which houses a spectacular diversity of frogs, toads, salamanders, newts and caecilians. Mountain chicken frogs are among the largest frog species, with adults growing up to 8 inches long and weighing up to 2 pounds. These large frogs have various types of camouflage; their chestnut-brown color can come in spots or stripes, while their bellies are a dark yellow. A black line often runs from their snouts to the angle of their mouth. Once abundant in six of the Caribbean islands, the species is now confined to just Dominica and Montserrat. 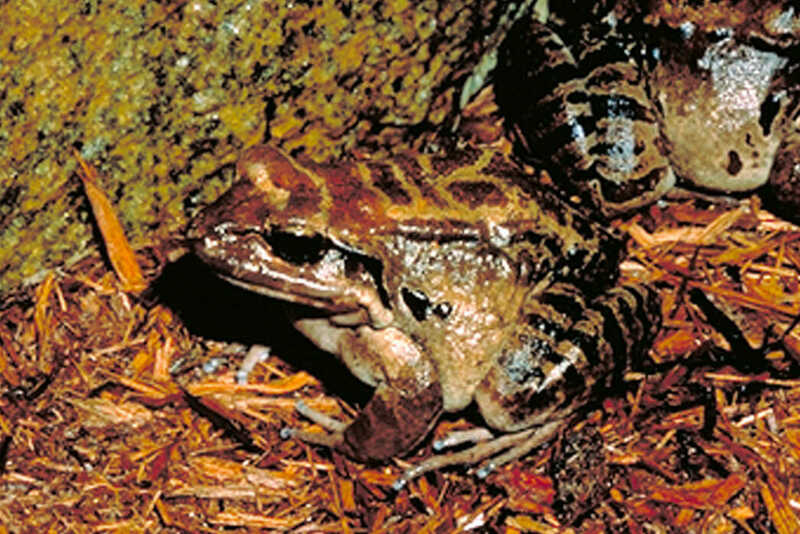 The calls of the mountain chicken frogs are a very loud "wooop" which can be heard both day and night. The mountain chicken frogs are foam nesters. During breeding, foam nests are built by whipping up body secretions; the thick foam nests are where eggs are laid and tadpoles develop. Both parents guard the nests until froglets emerge. The females routinely rebuild the foam back up as tadpoles develop, and lays infertile eggs for the developing tadpoles to eat. While many other frogs reproduce in water, these frogs lay their eggs in a burrow about 20 inches in the ground. Breeding occurs in April, toward the end of the dry season.